Box art and figurines of Disney Infinity, featuring the Starter Pack characters; Captain Jack Sparrow, Mr. Incredible, and James P. Sullivan "Sulley"
Disney Infinity was an action-adventure sandbox video game developed by Avalanche Software and published by Disney Interactive Studios. It was announced on January 15, 2013 and developed for approximately $100 million. The game uses collectible figurines that are then synchronized with the game, unlocking characters from Disney and Pixar properties that interact and go on adventures. The game was released for Xbox 360, PlayStation 3, Wii, Wii U, and Nintendo 3DS in August 2013. A PC version of Toy Box was also released on November 14, 2013. The second edition, Disney Infinity: Marvel Super Heroes, was released on September 23, 2014. The third edition, Disney Infinity 3.0, was released on August 30, 2015, and introduced support for the Apple TV. On May 10, 2016, Disney announced on the Disney Interactive website that they were discontinuing production, with three characters from Alice Through the Looking Glass and a Finding Dory playset being the last releases for the platform. There are a number of playsets available, which are accessed via placing the relevant playset piece onto the Infinity Base. Some examples include Pirates of the Caribbean, Monsters University, The Incredibles, Cars, The Lone Ranger, and Toy Story. These playsets had their own unique campaign, which could be played with up to two players. However, all characters from a specific franchise can only play in their respective playset (for example, Mr. Incredible can't be used in the Pirates of the Caribbean playset), meaning two figures from the same series are required to play a play-set in split-screen multiplayer. Playing through play set unlocks objects and vehicles that could be used in the Toy Box mode. Toy Box mode allows players to create their own game in an open-world arena. Players can mix and match everything that is unlocked within each of the play-sets including characters, weapons and gadgets. By unlocking new content in the Disney Infinity play-sets, players are able to build their own worlds and essentially create their own game. There are various "adventures" in this mode, which help teach the player how to use the mode's tools. Players can also earn "spins" by playing through playsets or leveling up their characters, which can be used to unlock additional items. The mode supports online multiplayer, in which players can play around with items that only the other player has, albeit only during that session. Characters playable only in the Toy Box include Sorcerer's Apprentice Mickey Mouse, Jack Skellington, Rapunzel, Anna, Elsa, Wreck-It Ralph, Vanellope, Phineas and Agent P.
Power Discs are discs that can be placed on the Infinity Base along with their characters to add new elements to the game. Players can use up to three environment enhancements (Hexagonal Power Discs) that can only be used in the toy box mode and up to two character enhancements (Circular Power Discs) per character. The environment enhancements can alter the terrain, change the background "sky," add new vehicles or add new weapons. The character enhancements will alter things about the character such as damage done, replenish health, allow for faster experience gain for leveling and so on. One Power Disc is included with the Starter Pack while additional discs are sold in blind bags each containing two discs. Following a delay, the PC version of Disney Infinity was released on November 14, 2013. This version is available free of charge and can be downloaded from the official Disney Infinity website. This version originally contained only the game's Toy Box mode, similar to the iPad version. However, a patch was released on February 28, 2014 that added in all six Play Sets, putting it on par with the console versions. The game features several changes from the console version, however. The game does not support the Infinity Base. Instead, characters are unlocked either by purchasing them from the Disney Infinity website (at a discounted rate, due to the lack of a physical figurine) or by redeeming a web code card included with the physical figurines. Since Power Discs do not come with web codes, they must be purchased from the PC Shop. The game also does not support multiplayer, though players can link up with the console version to share Toy Boxes between the two versions. Due to the space limitations of the Wii platform, some design decisions had to be made in the game. The gameplay does not have online play or multiplayer in Playsets, but there is multiplayer in Toy Box. That means that there are smaller playset worlds and no downloadable or shareable toy box worlds. Toy Box has six different worlds, each with different toys and tools. On August 21, 2014, the Disney Infinity software was released as a free download for the North American Wii U eShop, for the convenience of upgrading to the superior Wii U version for players who originally own the Wii Starter Pack, although the Wii version is backwards-compatible on Wii U. The game's subsequent sequels were not available for Wii. The following is a list of character figurines that have been released and announced for Disney Infinity. 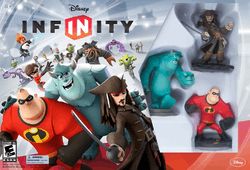 The starter pack, which includes the game and Infinity Base, contains figures for Sulley (Joel McCrary), Captain Jack Sparrow (Jared Butler), and Mr. Incredible (Craig T. Nelson), and three playsets based on Monsters University, Pirates of the Caribbean, and The Incredibles. Additional figures and playsets are sold in special packs, whilst certain figures are sold separately. ^a : Also available in a translucent variant, as part of the "Infinite" series, exclusive to Toys 'R Us. ^b : Timed exclusive at Walmart. ^c : Timed exclusive at GameStop. ^d : Timed exclusive at Best Buy. ^e : Timed exclusive at Target. ^f : Only available in the United Kingdom. Disney Infinity received generally positive reviews from critics (except for the 3DS version, which received negative reviews). It received a 74 and 75 out of 100 on review aggregator site Metacritic, for PlayStation 3 and Xbox 360 respectively. The sandbox mode, namely the Toy Box Mode, received much praise. Steven O'Donnell of Good Game: Spawn Point stated that "it's a bit like Minecraft in that you're dropped into an open world that you can then build some pretty spectacular structures in." Kevin VanOrd of GameSpot called the Toy Box "a gleefully entertaining shared space," and greatly preferred it over the story mode. The figurines of the playable characters received mixed to positive reactions. Daniel Krupa of IGN said that they're "well-made statues," and that "each one really captures the personality of that character with a charismatic stance." The soundtrack and dialogue of Disney Infinity also received mixed reactions. Andrew Reiner of Game Informer said that "characters repeat dialogue way too often," and that the soundtrack is "often surprisingly absent." Andy Robertson of Forbes stated that his children loved playing the figurines, both in the game and as toys. The overall price of the game and all of the toys received media coverage. Jeff Cork of Game Informer said that to purchase all items at the launch (the game, all launch toys, and power discs) it costs a minimum of AUD$460. Kevin VanOrd of GameSpot called Disney Infinity "a platform designed to keep you spending money." Nick Cowen of The Guardian warned parents to "get ready with those wallets." In September 2013, Disney revealed that the game had sold 294,000 copies in the United States during its first two weeks on sale. On October 18, 2013, Disney Interactive announced that the game had sold more than one million copies worldwide. With more figures not yet released, Disney hopes the number of units sold will continue to grow. As of January 20, 2014, three million starter packs has been sold. The game was nominated for the Nickelodeon Kids' Choice Awards in 2014, but lost to Just Dance 2014. On May 10, 2016, the future plans for Disney Infinity were cancelled, although the reasons why are currently not clear. On April 30, 2014, Disney announced a follow-up game, Disney Infinity: Marvel Super Heroes, for release on Xbox 360, PlayStation 3, PS Vita, Wii U, iOS, PC, Xbox One, and PlayStation 4 in Q4 2014, featuring characters from the Marvel Comics universe, as the first installment of Disney Infinity 2.0. The game features improved Toybox editor tools and introduces Toybox Games, discs which allows players to create games based on genres such as tower defense. The game is also compatible with all figurines and accessories from the previous Disney Infinity. The starter pack contains figures of Iron Man, Thor, and Black Widow, with figures being released separately alongside the game such as Captain America, Hulk, Hawkeye, Falcon, Loki, Stitch, Maleficent, Donald Duck, Tinker Bell, Princess Mérida, Hiro Hamada, Baymax, Aladdin, Jasmine, the Guardians of the Galaxy, Ronan the Accuser, Spider-Man, Nova, Iron Fist, Venom, Nick Fury and the Green Goblin. On May 5, 2015, Disney announced a follow-up game through Game Informer, Disney Infinity 3.0, for release on Xbox 360, PlayStation 3, Wii U, iOS, PC, Xbox One, and PlayStation 4 in 2015, featuring characters from the Star Wars universe and Iron Man Hulkbuster. ↑ "Namco Bandai And Disney Are Buddies In Japan". Silicon Era. 2013-09-11. 1 2 "Disney launches Infinity video game that costs more than an iPad Mini". Daily Mail. January 16, 2013. Retrieved January 17, 2013. ↑ Graser, Marc (2013-06-12). "Disney Hopes New Videogame Will Bolster Its Worst Performing Division". Variety. Retrieved 2013-06-19. 1 2 3 Blackburn, John (10 May 2016). "An Update on Disney Infinity". Disney Interactive. Retrieved 10 May 2016. 1 2 Disney INFINITY (29 May 2013). "Disney INFINITY Playsets". Disney INFINITY Figures. Retrieved 29 May 2013. 1 2 Nichols, Scott (18 January 2013). "Disney Infinity preview: Skylanders challenger not the usual toy story". Digital Spy. Retrieved 21 January 2013. 1 2 Disney, Infinity (29 May 2013). "Disney Infinity Toy Box Mode". Disney Infinity. Retrieved 29 May 2013. ↑ Butts, Steve (August 14, 2013). "Disney Infinity Goes Mobile". IGN. Retrieved August 20, 2013. ↑ Infinity, Disney (27 June 2013). "Disney Infinity Starter Pack". Disney Infinity UK. Retrieved 27 June 2013. ↑ Disney Infinity (24 April 2013). "Disney INFINITY Figures — Power Discs". Disney Infinity Figures. Retrieved 24 April 2013. ↑ Robertson, Andy (2014-02-28). "Disney Infinity Play Sets Land On PC With Huge Discounts". Forbes. Retrieved 2014-03-27. ↑ "Disney Infinity Finally Arrives on PC". Kotaku.com. 2014-03-05. Retrieved 2014-03-27. ↑ "Disney Infinity PC Shop". Disney. Retrieved 2014-03-27. ↑ Infinity, Disney (18 August 2013). "Disney Infinity - Game Profile (Wii™)". Disney Infinity. Retrieved 30 October 2013. ↑ Infinity, Disney (18 August 2013). "Disney Infinity - Hints: Toy Box Mode (Wii™)". Disney Infinity. Retrieved 30 October 2013. ↑ Suszek, Mike (22 August 2014). "Upgrade Disney Infinity Wii to Wii U free of charge". Joystiq. Retrieved 23 August 2014. ↑ Fahey, Mike (22 August 2013). "If You Like Disappointment, You'll Love Disney Infinity 3DS". Kotaku. Retrieved 25 August 2013. ↑ Disney Infinity Figures (3 June 2013). "Disney Infinity Playset". LC Digital World. Retrieved 3 June 2013. ↑ "Disney Infinity for PlayStation 3". GameRankings. Retrieved 24 August 2013. ↑ "Disney Infinity for Wii". GameRankings. Retrieved 24 August 2013. ↑ "Disney Infinity for Xbox 360". GameRankings. Retrieved 24 August 2013. ↑ "Disney Infinity for 3DS". GameRankings. Retrieved 21 September 2013. 1 2 "Disney Infinity for Xbox 360 Reviews". Metacritic. Retrieved 24 August 2013. 1 2 "Disney Infinity for PlayStation 3 Reviews". Metacritic. Retrieved 24 August 2013. ↑ "Disney Infinity for Wii U Reviews". Metacritic. Retrieved 8 September 2013. ↑ Reiner, Andrew (18 August 2013). "Fun With The Toy Box". Game Informer. Retrieved 24 August 2013. ↑ Peterson, Blake (20 August 2013). "Disney Infinity Review". Game Revolution. Retrieved 24 August 2013. 1 2 3 VanOrd, Kevin (22 August 2013). "Disney Infinity Review". GameSpot. Retrieved 24 August 2013. ↑ Cooper, Hollander (18 August 2013). "Disney Infinity review". GamesRadar. Retrieved 24 August 2013. ↑ Jones, Brandon (18 August 2013). "Disney Infinity Review Text". GameTrailers. Retrieved 24 August 2013. 1 2 3 Krupa, Daniel (18 August 2013). "Disney Infinity Review". IGN. Retrieved 24 August 2013. ↑ Cowan, Danny (19 August 2013). "Disney Infinity review: Dream it. Do it.". Joystiq. Retrieved 24 August 2013. ↑ Hayward, Andrew (18 August 2013). "Disney Infinity review". Official Xbox Magazine. Retrieved 24 August 2013. ↑ Crecente, Brian (18 August 2013). "Disney Infinity review: Imagination land". Polygon. Retrieved 24 August 2013. ↑ Davies, Emma (18 August 2013). "Disney Infinity PS3 review - Expansion figures highyl in the House Of Mouse's latest". PlayStation Official Magazine. Retrieved 24 August 2013. ↑ "Good Game Spawn Point - Disney Infinity". Australian Broadcasting Corporation. Retrieved 24 August 2013. ↑ Robertson, Andy (August 18, 2013). "Disney Infinity Review: Show Time". Forbes. Retrieved August 19, 2013. ↑ Cork, Jeff (2013). "Dragon vs. Mouse". Game Informer. GameStop Corporation (45): 29. ↑ Cowen, Nick (22 August 2013). "Disney Infinity – review". The Guardian. Retrieved 24 August 2013. ↑ Makuch, Eddie (17 September 2013). "Disney Infinity sells 294,000 copies in US". GameSpot. CBS Interactive. Retrieved 18 September 2013. ↑ Graser, Marc (18 October 2013). "Disney Infinity' Reaches 1 Million Global Sales Milestone". Variety. Retrieved 1 November 2013. ↑ Handrahan, Matthew (20 January 2014). "Disney Infinity sells 3 million starter packs". GamesIndustry.biz. Games Network. Retrieved 21 January 2014. ↑ "Disney Infinity Marvel Superheroes Coming This Fall". Kotaku.com. Retrieved 2015-07-15. ↑ "June Cover Revealed – Disney Infinity 3.0 - News". www.GameInformer.com. 2015-05-05. Retrieved 2015-07-15.